One hears so much about start-ups, high-tech firms, and digital whiz kids that it's hard to keep track of them all. Not only are there a lot of them, but the vast majority of them seem to disappear after a while as well. Are these firms (and their creators) really worth all of this attention? One such company called Uptake is certainly worth some notice from the construction industry. Founded by Groupon whizzes Brad Keywell and Eric Lefkofsky, Uptake obtains funding for and helps to develop "disruptive technologies". Disruptive technologies are defined as ones that completely transform an industry. These technologies don't just make profound changes, these are changes that will permanently affect how these industries do business. So why exactly should the construction industry be excited at what two guys who started a discount club are doing? Because of this company's work with software to improve business safety, security, data analysis, collection, storage, and distribution. Managers already know that construction software like Raken for daily reporting saves time and money in overall project data gathering using mobile devices. And now construction software developers are turning their digital sights on another kind of equipment found at construction sites. Caterpillar Incorporated recently invested $45,000,000 with Uptake for the development of construction site equipment and vehicles with imbedded software that allows data to be collected and analyzed while the vehicle or equipment is being operated. This concept of really smart working machines is known as telematics. 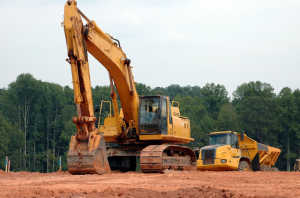 Construction telematics is something that the construction industry has been interested in for a number of years. Trucks and dozers and even generators that can collect and store data on that machine's fuel use, hours used, and when it's time for maintenance have been at sites for years. These data systems were created by manufacturers to look at equipment use individually, and the data had to be collected manually. But the construction equipment software now in development will change this process in several significant ways. 1. Data CollectionEver spend a morning driving around a site going from dozer to backhoe, logging in their miles and hours individually, then trying to incorporate these figures into a report showing how equipment is being used overall? How about a system in which your equipment routinely sends all of this information to a central site which then thoughtfully analyzes data on everything from physical location to fuel consumption and breaks everything down for you? 2. Predictive LearningAlso known as "machine learning", software algorithms allow machines to recognize patterns that allow them to perform simple tasks, like identifying themselves when being tracked by GPS or driving themselves from place to place. 3. Increased EfficiencyHeavy equipment that lets you know where it is when it will be back, how much fuel it uses and when it's time to go to the doctor? Not to mention contributing to reports and making on-site deliveries without having to take a coffee break? In addition to reducing time now spent on coordination and data collection by staff, this "smart" equipment can also help managers make decisions about customers to target and work schedules, meaning not only time saved, but more profit earned. Some proprietary telematics squabbling among manufacturers continues, so all access to all equipment data doesn't exist just yet, but managers should prepare for a near-future site scenario where a lot of the work is being done by formerly "dumb" machines.